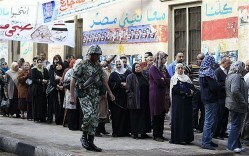 Egypt’s path toward democracy has been neither steady nor assured since its uprising last year. However, as the country prepares for a presidential election campaign—which follows on the heels of its Islamist-dominated parliamentary elections several months ago—it finally appears set to install its first-ever fully democratically elected government. Tobin doesn’t explain how a more U.S.-friendly democracy would have emerged under the aegis of a U.S.-backed dictatorship, nor does he see the apparent contradiction in knocking the Obama administration for “dumping” Mubarak even as his own publication frequently complains about Russia’s continued support for the autocratic Bashar al-Assad in Syria. One could be forgiven, moreover, for suspecting that Tobin is advocating the subjugation of a nation of 80 million people for the sake of Israel’s subjective sense of security. The substance of Tobin’s critique ultimately has less to do with the Obama administration’s choice of candidate, which is clearly a bid for what must seem to Washington as the safest bet, but rather with the administration’s apparent acquiescence to the likely choice of Egyptian voters. What Tobin calls the Brotherhood’s bid for “untrammeled power” is really just its decision to field a candidate for a democratic election—something that less interventionist commentators would concede is any party’s right in an emerging democracy—and he laments that the country’s unelected military leaders should be constrained to share power with an elected civilian faction he finds distasteful. Tobin’s dirge for military rule illuminates the ongoing confusion on the neoconservative right about how best to respond to democratic uprisings in a region governed for decades by U.S.-backed autocrats — a divide that dates back to Jeanne Kirkpatrick’s 1970s-era thesis that right-wing “authoritarian” governments are more amenable to democratic reform than left-wing “totalitarian” states. While the likes of Tobin, Frank Gaffney, and Caroline Glick have made pleas for the region’s anciens regimes (and while FDD's Andrew McCarthy has accused the Obama administration of "rain[ing] down a billion-and-a-half more American taxpayer dollars" on the Brotherhood in the form of aid to Egypt) , former Bush administration neocons like Elliott Abrams and Zalmay Khalilzad have imprudently suggested that the uprisings somehow vindicate the Bush administration’s “freedom agenda” of democratization by force. If Tobin is so concerned about U.S. “influence” in Egypt, he might do well to reconsider whether turning its back on Egypt’s broadly backed political forces and advocating a return to a loathed military dictatorship is the best way forward.